Like M&Ms an evening of monologues and musicals comes with the possibility of being a perfect combination of Ms, especially with a focus on Firsts on close to the first anniversary of me seeing Butter Side Up Theatre Company perform for the first time. 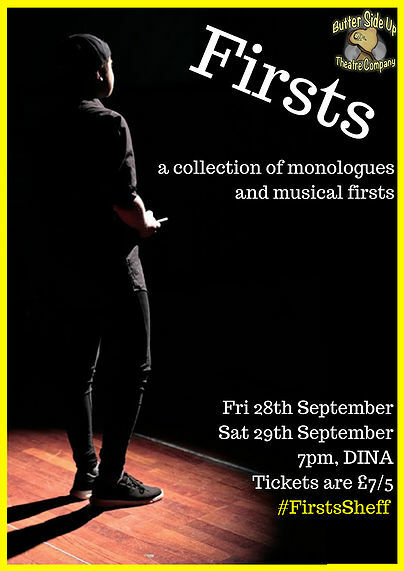 Firsts, is an original play, made up of a collection of monologues, written by Michael Hudson and initially performed as part of Thestival 2015, an original writing theatre festival by Sheffield Hallam Theatre Society, which has since been amended and updated. The monologues are all themed around the ‘first’ of something, which aim to emphase that whether a big moment or a passing memory, the first occurrence of something can be important to the way we live, relate to others and develop as people. Beautifully, movingly, sadly and happily capturing the firsts we all experience and those firsts we hope we and those we love do not have to, Firsts made us audience members both smile and laugh out loud and move to tears. The combination of writer and director’s Michael’s wonderful honest, empathic and natural writing that perfectly captured the emotions of the situations, and those they affected, combined with the superb acting of the cast (Emily Briddon, Nicola Fyfe, Scott Gist, Max Marriott and Lucy Smith-Jones), who spoke and performed with a passion, emotion and depth that if you did not know otherwise would make you 100% sure that they were sharing their own personal stories from the heart with those closest to them. The clever use of the five chairs, five books and five glasses and the movement of them and the cast around them during and between monologues both added to and moved the monologues forward and allowed the other cast mates to physically act as an emotional support to each other. Firsts was accompanied by Overture, a compilation of songs from the stages of the West End and Broadway, directed by first time Emily Capp. Also themed around ‘firsts’, the set list offers an anthology of solos, duets and group numbers that represent the first song in a show, first appearance of a character, first song to win different awards and more. The songs, each introduced by Emily in person, brought together the sweet, joyful musical voices and vocal harmonies of the cast (Emily Capp, Becky Cleary, Heather Gibb, Scott Gist, Hannah Henley, Michael Hudson, Max Marriott, Sian Meredith, Rob Place and Bethan Tanner) with their abilities to capture the personalities and essences of the characters whose numbers they were performing. And, led by Emily Capp, the bold, powerful and attitude packed full cast final number from “The Greatest Showman”, that may have finally convinced me I really should see the film. However my award for best singing voice of the night must go to Rob Place, who in his solo number “Taylor The Latte Boy” displayed the ultimate combination of great voice, great vocal range, great personality and great stage presence. As an audience member I left DINA emotional, thoughtful, reassured that I’m not alone, upbeat and with the desire moving forward to remember more of my future firsts and watch even more musicals. This evening of two parts provided a strong showcase for the company and it’s members range of acting, singing, directing and writing skills and as always with their productions made me excited to see what they will do next. Your final chance to see this celebration of Firsts is on Saturday 29 September at 7.30pm at DINA. Tickets are £5 in advance from www.eventbrite.co.uk/e/bsu-presents-firsts-tickets-48598841443?aff=es2 and £7 on the door. Butter Side Up Theatre company is a new amateur theatre group in Sheffield, specialising in original writing and collaborative works. It was set up as a group for those who wanted to enjoy theatre and performing in a fun and friendly setting. They welcome people of all levels of theatre experience, to get involved with writing, acting, directing, backstage, marketing and multimedia content, in a range of projects. Named after a running joke in Seussical the Musical, Butter Side Up is a fun but committed collection of people who want to create entertaining performances for the city of Sheffield. For further information visit www.buttersideuptheatre.com, like on Facebook at www.facebook.com/ButterSideUpTC, follow on Twitter at https://twitter.com/buttersideuptc, subscribe to their Youtube channel at www.youtube.com/channel/UCI11Yd6-9J-TxhDeUGXryMA or follow on Instagram at www.instagram.com/buttersideuptheatre/. Housed in a building created from the merger of a Sunday school and a spoon factory in the centre of Sheffield, DINA provides a hub for creative and digital practice, hosting music, learning adventures, performances, exhibitions and a social café. For further information visit www.facebook.com/dinavenue. P.S. I’m so glad I’m not the Claire in the Firsts first Christmas dinner cooked monologue.